This Beautiful Tennis Bracelet is made with Asscher Cut Swarovski Zirconia set on Solid Sterling Silver, Platinum, yellow or rose gold plated to look and feel exactly like gold. High Quality Manufacturing. 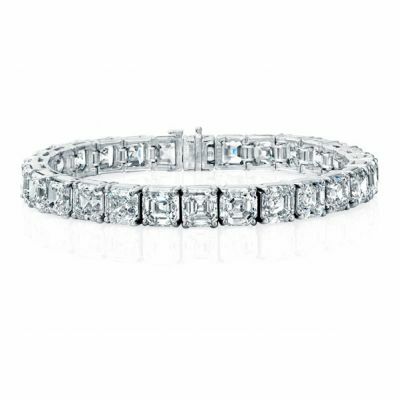 Made with the highest quality Cubic Zirconia in your choice of 7" or 8" long. The weight of the bracelets range between 12.50 grams to 39.70 grams, depends on the length and weight of the bracelet. It has 3 way clasp for an extra secure closure. This CZ bracelet utilizes stones manufactured by Swarovski and cut to perfection to be the finest quality simulated diamond in the world. A little shimmer... Every woman loves that something special that comes from diamonds. And while diamonds may be a girl's best friend, cubic zirconia jewelry is the budget-minded woman's best friend. Our collection of cubic zirconia Silver jewelry has that special gleam, but without the high price tag.